Jacobs Ladder is a patented commercial cardio machine specifically designed for fitness enthusiasts, athletes and professionals. Its unique design places the user at a 40° angle in order to take stress off of the lower back. Jacobs Ladder is the ideal machine to add to your current fitness routine, and is the best low-impact training tool on the market today! Study after study confirms that exercise using both the arms and legs requires more energy expenditure, and therefore burns more calories than exercises using just the arms or the legs. 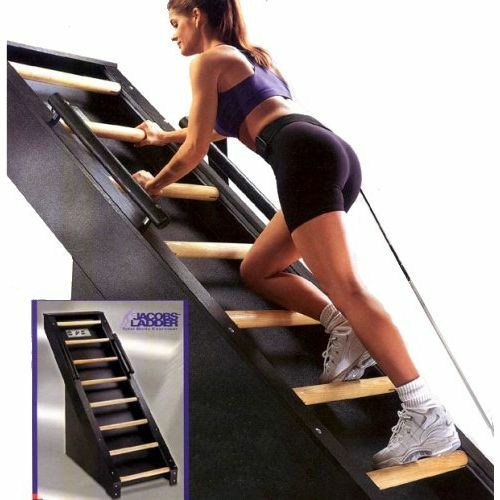 So, unlike stair-climbers, stationary bikes, and other standard club equipment, Jacobs Ladder Stairclimber can offer exercisers a superb cardiovascular workout in a relatively short amount of time.Order your Jacobs Ladder from FitnessZone.com today! Chat with one of our friendly agents at FitnessZone and learn more about the Jacobs Ladder. 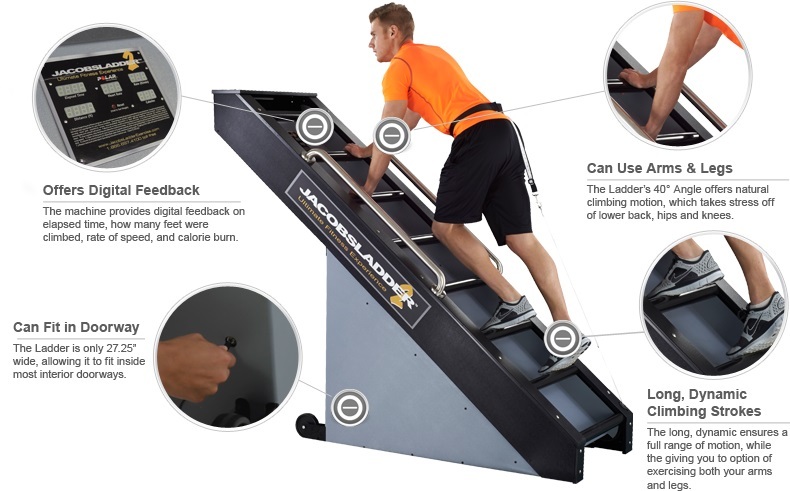 Universities and professional sports teams agree that Jacobs Ladder Stairclimber is the ultimate fitness experience. The unique design on the machine allows for both aerobic and anaerobic workouts. Aerobically, Jacobs Ladder not only increases heart rate quicker than other machines, but correspondingly results in increased VO2MAX levels. Jacobs Ladder also offers the athlete the option of HIIT (high intensity interval training). Because speed of the rungs is determined by the user, HIIT interval training can be achieved by utilizing 1-3 minute intervals at 85-90% maximum heart rate. Jacob's Ladder emulates sprinting or stair climbing without incurring the high impact on joints. While traditional stairclimbers, ellipticals and treadmills are well-suited for the recreational athlete, Jacobs Ladder was designed to offer the training athlete an improved method for in-season, pre-season and post-season workouts. Jacobs Ladder was initially designed to accommodate people who had back pain and were unable to get aerobic exercise on traditional commercial equipment. The patented design resulted in a commercial cardio machine that accommodated not only people with back issues but also people with knee, ankle and hip problems. Jacobs Ladder automatically adjusts to your speed. The faster you go, the faster it goes. This allows the attending medical professional to ensure that the patient is not over or under worked. The readouts in Rate (Ft/Min), Distance, Calories, and Elapsed Time give the patient the ability to monitor progress over time. Jacobs Ladder is an ideal cardio machine for users looking to come back from an injury. Its unique design allows for a low impact workout, while still delivering results. The FBI, Army Rangers and Navy Seals are already using Jacobs Ladder to improve their strength and conditioning programs. 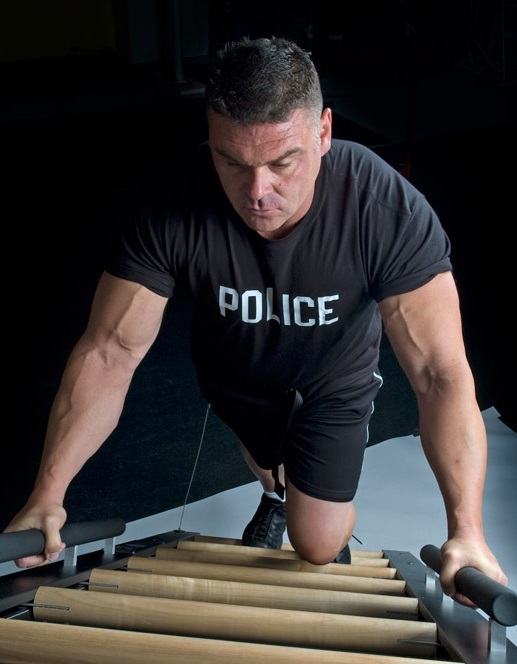 Jacobs Ladder is ideal for military, fire and police training. With the innovative design of Jacobs Ladder, stress is taken off the lower back, which enables an intense aerobic or anaerobic workout that simulates actual challenges that military, fire and policemen face everyday. Order your Jacobs Ladder from FitnessZone.com today!